Be it for commercial buildings, public schools, churches, or transit centers, there are several different ways that restroom stall partitions can be arranged to best suit the needs of your users. From baked enamel to stainless steel to plastic, at XPB Locker, our restroom stall partitions are available in a variety of materials so that no matter what the budgetary restrictions, facility managers and owners can create any layout that works for them. There are four basic layouts that are used in the design of restroom stall partitions. Here at XPB Locker we can help you with choosing the right layout that suits your spatial needs. We can also provide you with drawings and find you the sources that offer the best possible lead times. This type of layout features a stall that is created using the corner of the bathroom facility. The pilasters create the stall’s support and frame the door. This system of restroom stall partitions can consist of one or multiple compartments, with the side farthest from the bathroom wall created with a panel as opposed to the other bathroom wall. A single bathroom stall, or a sequence of connected stalls, can be created between two walls of the restroom facility. In the case of multiple restroom stall partitions, each individual compartment is separated from one another by a divider, and each door is flanked by a pilaster that is shared by the adjacent toilet compartment. Unlike the other layouts of restroom stall partitions, this layout is made up of a singular restroom stall with three walls of the bathroom facility as its boundaries. The fourth wall is made up of a long panel, with the door usually offset on one side of it or the other and framed by two pilasters—one separating the door from the wall and one separating the door from the panel. This layout consists of one or more bathroom compartments using the restroom facility wall as the back wall. Whether single or multiple, the entire system of restroom stall partitions uses a panel as the boundary for each end. Each compartment is separated by a divider and has a door flanked by pilasters on each side. Large restrooms use this layout most often, specifically in men’s restrooms where the group of stalls may also be accompanied by mounted urinals and urinal screens. 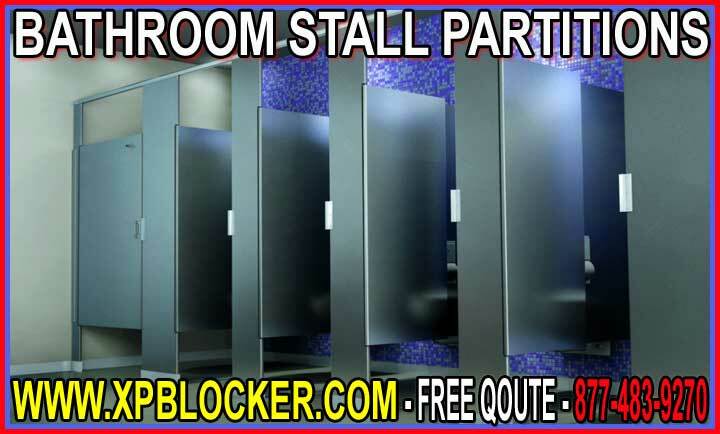 If you need help in deciding how to mount your restroom stall partitions, XPB Locker can accommodate you. Along with restroom stall layouts, we also offer the various mounting configuration styles that you should consider also. Below are the four most commonly used mounting configurations in public and commercial bathrooms. The size of your bathroom and the type of construction it is plays a role in which type you select for your application, along with floor thickness and ceiling height. Floor Mount restroom stall partitions are anchored directly to the floor and are left unattached at their upper ends. These are best used where both traffic and the risk of vandalism are low. These restroom stall partitions are highly common in restrooms of all kinds. They are a lot like Floor Mount partitions except there is an extra point of attachment at their top, consisting of a metal brace that ties back to the walls for superior durability and stability. These partitions have pilasters that anchor to the floor at the bottom and to a ceiling beam, as a combination of Floor Mount and Ceiling Hung. This results in a very durable mounting configuration. Like the floor braced style, these restroom stall partitions have only one point of attachment, but their attachment is to the ceiling at their tops. Ceiling Hung partitions have a floating effect, since they do not touch the floor. This makes for easy cleaning by maintenance crews and can also add a sense of modernity to your restroom facility. A pre-installed structural ceiling support is required and ceiling heights over 8 feet are not recommended for this type of mounting configuration. These are also not appropriate in vandalism-prone buildings that are also high-traffic. With many styles and materials to choose from, let XPB Locker be your source for restroom stall partitions, whether it’s in the case of new building construction or a remodel. Don’t hesitate to call us for any help in finding the perfect partitions for your needs.